This section explains how to configure the robot based on the communication channel you will use for your developments, thus you need to read only one of the following sections, but it would be better if you spend a bit of time reading them all in order to have a full understanding of the available configurations. The main microcontroller is initially programmed with a firmware that support USB communication. If the main microcontroller isn't programmed with the factory firmware or if you want to be sure to have the last firmware on the robot, you need to program it with the last factory firmware by referring to section main microcontroller firmware update. When you want to interact with the robot from the computer you need to place the selector in position 8 to work with USB. Section PC interface gives step by step instructions on how to connect the robot with the computer via USB. Once you tested the connection with the robot and the computer, you can start developing your own application by looking at the details behind the communication protocol. Both USB and Bluetooth communication channels use the same protocol called advanced sercom v2, refer to section Communication protocol: BT and USB for detailed information about this protocol. The main microcontroller and radio module of the robot are initially programmed with firmwares that together support Bluetooth communication. When you want to interact with the robot from the computer you need to place the selector in position 3 if you want to work with Bluetooth. Section Connecting to the Bluetooth gives step by step instructions on how to accomplish your first Bluetooth connection with the robot. Once you tested the connection with the robot and the computer, you can start developing your own application by looking at the details behind the communication protocol. 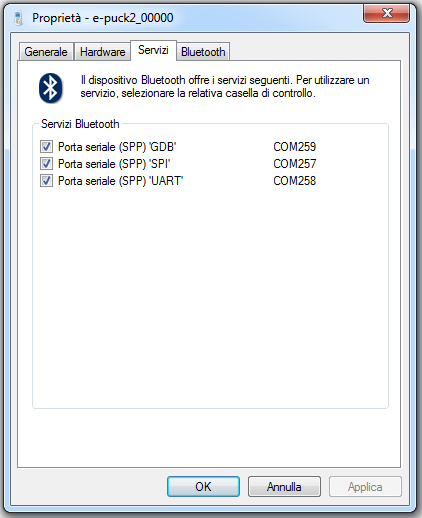 Both Bluetooth and USB communication channels use the same protocol called advanced sercom v2, refer to section Communication protocol: BT and USB for detailed information about this protocol. Put the selector in position 15. 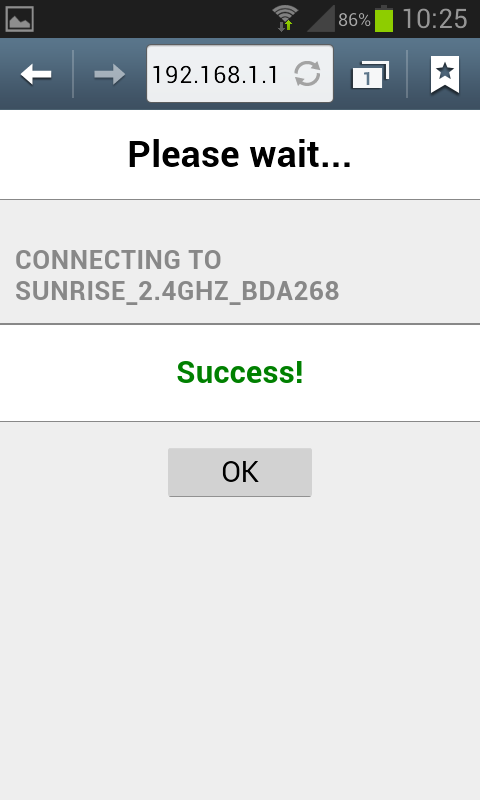 Section Connecting to the WiFi gives step by step instructions on how to accomplish your first WiFi connection with the robot. The communication protocol is described in detail in the section Communication protocol: WiFi. By default, the e-puck2 is not visible when you search for it in the Bluetooth utility of your computer. To make it visible, it is necessary to hold the USER button (also labeled "esp32" on the electronic board) while turning on the robot with the ON/OFF button. Then it will be discoverable and you will be able to pair with it. Note that a prompt could ask you to confirm that the number written on the screen is the same on the e-puck. just ignore this and accept. Otherwise if you are asked for a pin insert 0000. When you pair your computer with the e-puck2, 6 COM ports will be automatically created. 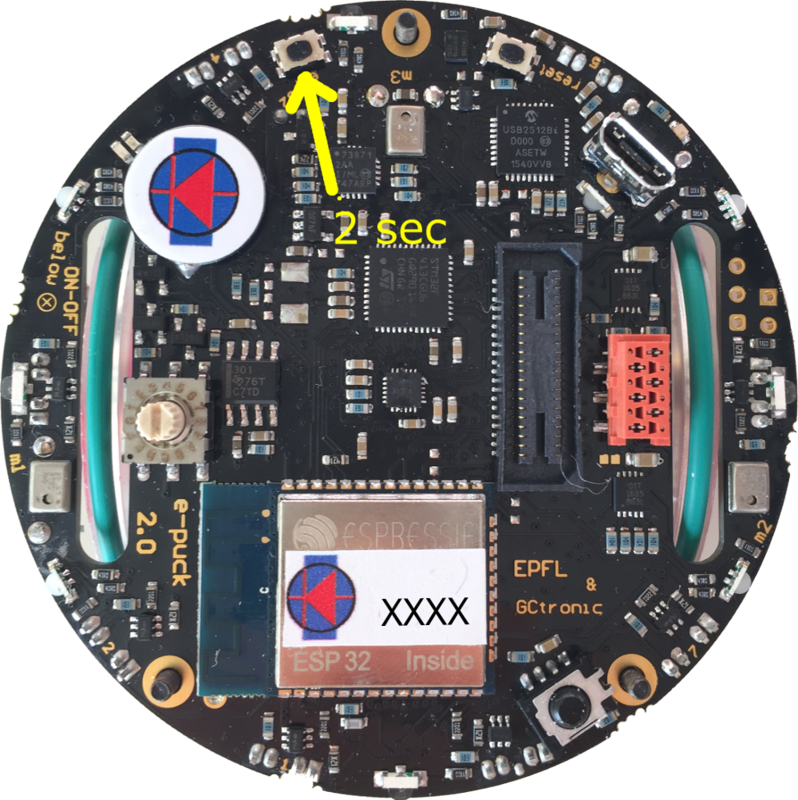 The three ports you will use have Outgoing direction and are named e_puck2_xxxxx-GDB, e_puck2_xxxxx-UART, e_puck2_xxxxx-SPI. xxxxx is the ID number of your e-puck2. 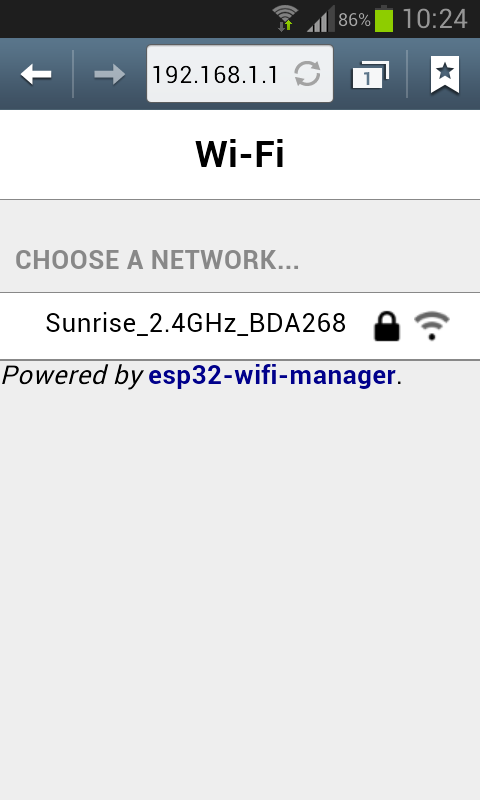 The MAC address is visible from the Bluetooth manager. The parameter 2 indicates the channel, in this case a port for the UART channel is created. If you want to connect to another service you need to change this parameter accordingly (e.g. 1 for GDB and 3 for SPI). Now you can use /dev/rfcomm0 to connect to the robot. When you pair your computer with the e-puck2, 3 COM ports will be automatically created: /dev/cu.e-puck2_xxxxx-GDB, /dev/cu.e-puck2_xxxxx-UART and /dev/cu.e-puck2_xxxxx-SPI. xxxxx is the ID number of your e-puck2. You need to download the PC application provided in section PC interface: available executables. You should start receiving sensors data and you can send commands to the robot. Alternatively you can also use a simple terminal program (e.g. realterm in Windows) instead of the PC application, then you can issue manually the commands to receive sensors data or for setting the actuators (once connected, type h + ENTER for a list of availables commands). Here is a simple python script multi-robot.py that open a connection with 2 robots and exchange data with them using the advanced sercom protocol. This example can be extended to connect to more than 2 robots. 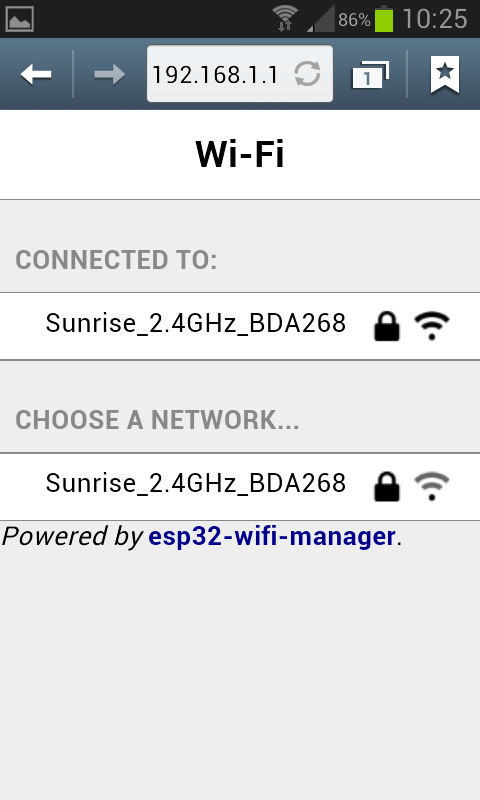 The WiFi channel is used to communicate with robot faster than with Bluetooth. At the moment a QQVGA (160x120) color image is transferred to the computer together with the sensors values at about 10 Hz; of course the robot is also able to receive commands from the computer. In order to communicate with the robot through WiFi, first you need to configure the network parameters on the robot by connecting directly to it, since the robot is initially configured in access point mode, as explained in the following section. Once the configuration is saved on the robot, it will then connect automatically to the network and you can connect to it. If there is no WiFi configuration saved in flash, then the robot will be in access point mode in order to let the user connect to it and setup a WiFi connection. The LED2 is red. The access point SSID will be e-puck2_0XXXX where XXXX is the id of the robot; the password to connect to the access point is e-puck2robot. You can use a phone, a tablet or a computer to connect to the robot's WiFi and then you need to open a browser and insert the address 192.168.1.1. The available networks are scanned automatically and listed in the browser page as shown in figure 1. Choose the WiFi signal you want the robot to establish a conection with from the web generated list, and enter the related password; if the password is correct you'll get a message saying that the connection is established as shown in figure 2. After pressing OK you will be redirected to the main page showing the network to which you're connected and the others available nearby as shown in figure 3. If you press on the connected network, then you can see your IP address as shown in figure 4; take note of the address since it will be needed later. Now the configuration is saved in flash, this means that when the robot is turned on it will read this configuration and try to establish a connection automatically. Remember that you need to power cycle the robot at least once for the new configuration to be active. Once the connection is established, the LED2 will be green. In order to reset the current configuration you need to press the user button for 2 seconds (the LED2 red will turn on), then you need to power cycle the robot to enter access point mode. Often the IP address assigned to the robot will remain the same when connecting to the same network, so if you took note of the IP address in section Network configuration you're ready to go to the next section. Run the PC application, insert the IP address of the robot in the connection textfield and then click on the Connect button. You should start receiving sensors data and you can send commands to the robot. The LED2 blue will toggle. When the robot is in access point mode you can have access to a web page showing the camera image and some buttons that you can use to move the robot; it is a basic example that you can use as a starting point to develop your own web browser interface. You can use a phone, a tablet or a computer to connect to the robot's WiFi and then you need to open a browser and insert the address 192.168.1.1/monitor.html. This section is the hardest part to understand. It outlines all the details about the communication protocols that you'll need to implement in order to communicate with the robot form the computer. So spend a bit of time reading and re-reading this section in order to grasp completely all the details. The communication is based on TCP; the robot create a TCP server and wait for a connection. This page was last edited on 20 March 2019, at 11:38.